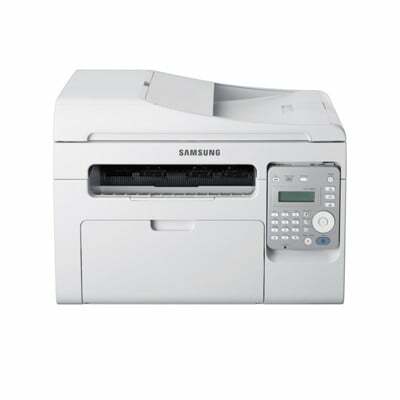 The Samsung SCX-3405F offers flexibility with print, scan, copy, and fax functions. It is an easy-to-use monochrome multifunction laser printer that fits well in a small business or home office. High points are the special economy button to save money, the ability to print black at very reasonable speeds, and added features to extend the life of the product. Unfortunately, there is no simple wireless printing setup for those who like to print directly from a tablet or mobile phone. The compact size is a benefit of the Samsung SCX3405F, measuring about 402 x 293 x 296 mm. It is also fairly lightweight at around 8 kg. It neatly includes four machines in one with the ability to print, scan, copy, and fax. It boasts excellent extra features like a dust resistant flip cover to keep paper clean and to protect the inner mechanics. The pop-up display with simple buttons that anyone can understand easily is a special feature. The paper output and paper tray are neatly designed on the front side of the printer as well. The Samsung SCX-3405F saves money and boasts eco-friendliness by saving on toner and paper with the built-in economy button. Printing on letter-sized paper yields about 20 ppm. It prints at a very good resolution of up to 1200 x 1200 dpi. Print what is viewed on a computer screen with the touch of a single button, which can be done even while away from the computer. This saves time when many documents or browser windows are open and displaying pertinent information for comparison. Sadly, it does not include easy-to-use wireless printing capabilities, which can simplify daily tasks like printing quickly directly from a mobile device. This should not get in the way for business users who print solely from desktop computers.